The design team had to find a solution to allow for a fully interactive and innovative journey whilst highlighting the vast portfolio of water treatment products. The solution put forward had to adhere to the design brief of the natural curves of flowing water. 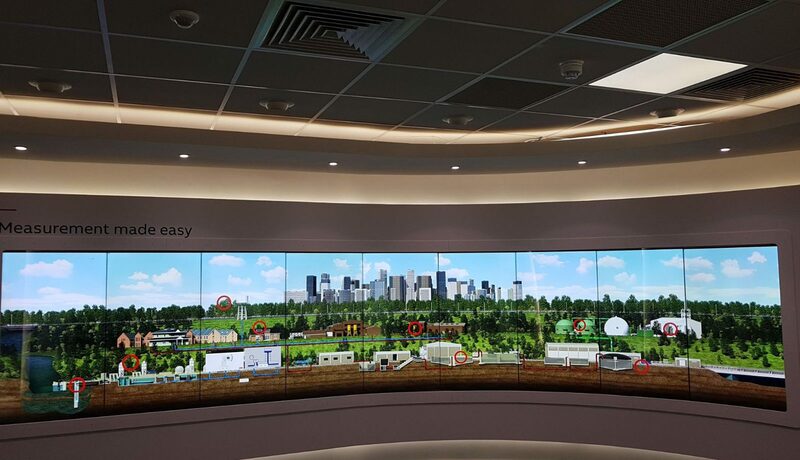 The ABB Experience Centre brief was to allow both Clients and visitors to take a journey through the water cycle from river to final discharge, as well as provide a Sales tool to highlight solutions and products offered by ABB. The Client wanted to evolve from simple factory walkthroughs touching physical products, into a high impact digital immersive environment for education and sales. 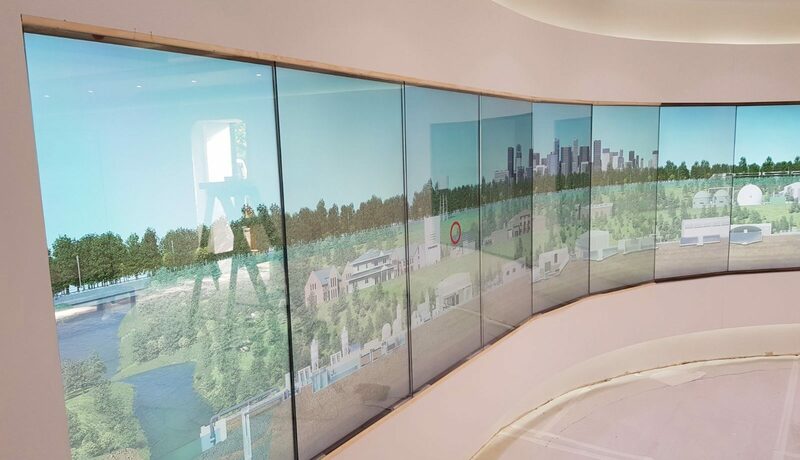 This presented a challenge with interactive touch as with the curved aspect of the video wall we could not utilise standard touchscreens – as we cannot bend light!! (with the best will in the world…) To get around this issue we specified glass foil overlays 5mm in front of the glass and less than 1mm apart to negate any interference from each overlay. 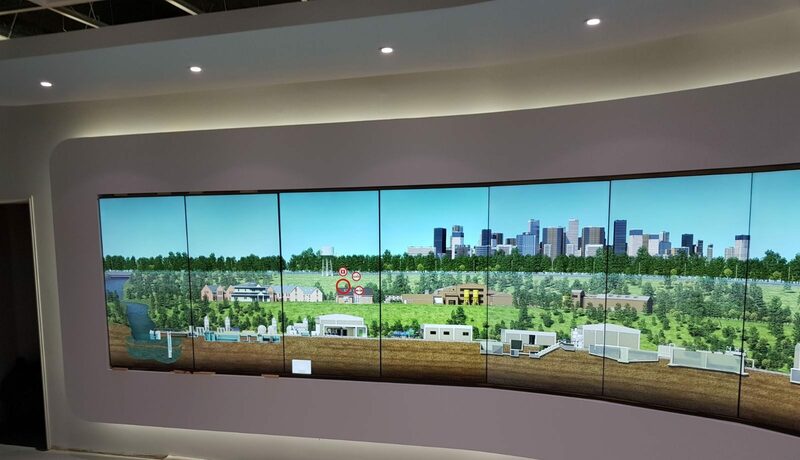 The animated content was display in landscape with emanating hotspots overlaid to create touch points to retrieve video and documents in 9 positions on the video wall. The interactive transparent glass specifications content is fuelled by a 6K Sony laser projector at an ultra-short throw distance in portrait orientation. The PC driven content is fully interactive and allows customers and visitors to view and rotate ABB products thereby creating a high impact effect on the fully transparent glass panel. This application was born out of a conversation about “CSI” and “Iron Man” in initial design brief discussions with the Client. The 55” totem screen is presented in a portrait orientation onto a manufactured plinth. The screen equipped with an onboard NUC PC and PIR sensor. The purpose of this screen is multi-faceted as it acts as a way-finder, and content player initially but when the PIR sensor detects movement nearby it plays introductory content for the audience. These touch screens are wall mounted and allow all visitors to take a virtual tour through the ABB factory and allows full pinch and grab to zoom in on products and internal facilities. This application will be further developed to showcase other ABB global productions hubs and offices. The Client was extremely happy with the end result of proved to be a challenging project. This technology was not considered “off the shelf” and presented our developers, designers and installation team with many challenges. All applications were bespoke and highly innovative for the offset. The Client has engaged us with ABB Global and we are currently planning similar Experience centers in the UK and abroad.